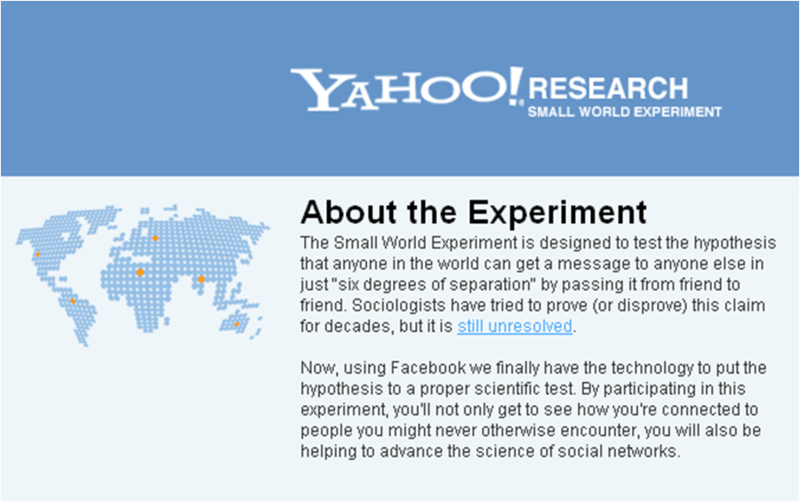 In 1967 Milgram and Traver's undertook their Small World Experiments. They measured how many steps it took for a package to make it's way from a randomly selected individual to a target elsewhere in the US. On average it took six steps for a chain to complete - a concept that was subsequently embodied in the idea of everyone on the planet being 'six degrees of seperation' away from each other. However, the sample size was small and the high fail rate is often overlooked. Is everyone really linked by six steps? Now it's the turn of Yahoo! Research. They are taking the best of both of these, setting the spirit of the Milgram experiment against digital infrastructure, but this time they are using Facebook. The new Yahoo! Small World experiment offers participants a target and then asks for them to choose one Facebook friend to help move the communication to that target. There is also the opportunity for users to nominate themselves as a target. 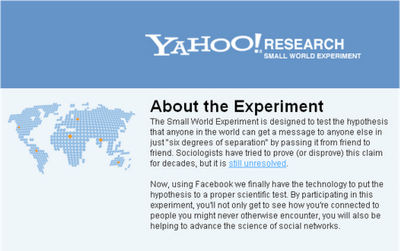 Will the results show that Facebook has made the world a smaller or larger place? Interested to see what they find! No matter how you look at it, there is no denying that the world is becoming much, much smaller! While it's true that information (news, trends, fashions, urban legend, rumour) travels faster, it's not necessarily the case that people are any more connected than they were at the time of Milgram's experiments. So this leaves us with an interesting problem; the world *seems* much smaller, while our personal networks and spheres of influence remain very similar. Does this lead to a reduced focus on what may practicably be achieved? @jake @mat Thanks for comments, interesting debate starting. Is the world smaller than it was? I think probably - if nothing else it's more searchable. Does this mean that it is easier to spread things? Yes and no. In theory things can spread much further, but in reality the pool of things that can spread is much larger (and information / content is not perishable now, it is archived online so even more noise to cut through.) So greater connectivity, but greater choice at the same time. There is also the problem that receiving something does not necessarily mean that it will be sent on. Interested to see the Yahoo! results.